In this post, you will find basic player information and goalscoring information after Week 8 of the Nigeria Professional Football League 2013. All players mentioned have played at least one match, or been on the bench at least once, during the first eight matches. * Watch out for Stephen Eze, an athletic, lanky and highly gifted centre-back, most likely still a teenager. Eze is a product of the youth set-up at Lobi Stars FC. Young midfielder Joshua Abanyi Aondongu has also shown a lot of promise so far this season. * I predict a good season from Lobi Stars FC. Star striker Tony Okpotu, who attended trials at Norwegian clubs SK Brann and Molde FK before the season, has been struggling with injury lately. When Okpotu returns in top form, he should be able to form a tremendous striking pair with Imenger Barnabas, the powerful striker who played for Trelleborgs FF (Sweden) in 2012. Further, the more experienced point man Chimaobi Nwaogu looks set for a great season. 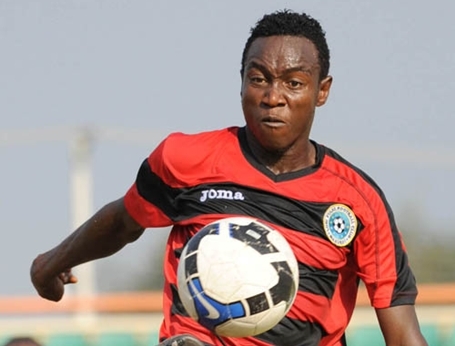 * The picture, found on http://www.felele247.com, is of Moses Orkuma, the hard-working central midfielder who plays for the Nigeria U-20 national football team.